Amos Eno was among the wealthiest and most prolific real estate developers of 19th century Manhattan. In 1888 he turned his attention to the block of South Fifth Avenue, between Prince Street and West Houston Street. Half a century earlier it had been a respectable residential neighborhood, but now was filling with factory buildings. Eno hired architect John H. Whitenach to design a substantial brick loft building that would replace the three old structures at Nos. 95, 97 and 99 South Fifth Avenue. Construction began on July 6 and was completed just over seven months later, on March 18, 1889. Whitenach blended Romanesque Revival and neo-Grec styles to create a factory and store building that was both utilitarian and attractive. (Eno apparently thought so, too, for the following year he had Whitenach produce a near-copy steps away at Nos. 87 through 91.) The buff colored brick was relieved by stone trim. Three rough-cut stone bandcourses sliced the building into a tripartite design, reducing its visual weight. The two cast iron storefronts that flanked the entrance to the upper floors were framed by brick-and-stone piers; while high above creative brickwork created the handsome corbel table and pediment of the all-brick cornice. The first tenant in the building was The Sterling Bindery, which moved in before April. Formerly located at Nos. 43-45 Centre Street, on April 11 it announced in The American Stationer that it had "removed to the new and spacious building 95 and 97 South Fifth avenue, and has increased its plant with several new machines of T. W. & C. B. Sheridan's latest patterns." The printing and binding firm moved in at a time when blue collar workers were standing up for themselves as the concept of labor unions gained traction. The "press feeders" were paid $10 a week in 1890, just over $250 today. Five of them, members of the Franklin Association of Pressmen and Feeders, demanded a $2 per week raise that spring. Manager George R. Macey turned them down. In response, the five men went on strike on May 13. The Documents of the Assembly of the State of New York, published in October 1892, noted that "a few other members of that organization stopped work in order to assist the feeders." Macey reacted by hiring new workmen to take their places. The strikers not only did not get a raise, they lost their jobs. 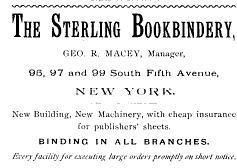 In 1893 The Sterling Bookbindery employed a surprisingly disproportionate number of women. There were 15 men, 40 women, and 30 girls under 21 years of age on the payroll that year. They worked 59 hours during the week and 9 on the weekend. Also in the building that year were A. A. Danzig, makers of ladies underwear; John Sasey, Jr., infants' wear manufacturers; and Rudolph Oeslner, an importer and brewer of beers. Oeslner's brewery was located in Illinois; but his headquarters and distributing warehouse of imported lagers were located here. Oeslner's was a substantial operation, evidenced on October 1894 when Ice and Refrigeration magazine noted "Rudolph Oeslner, an importer of beers, has erected a 10-ton refrigeration plant in his depot, 99 South Fifth avenue, New York city." In the spring of 1895 the City embarked on a project of widening and extending College Place. By cutting the street through existing blocks it would form a connection to West Broadway and South Fifth Avenue--one continuous thoroughfare from Dey Street to Washington Square. Businessmen like Rudolph Oeslner predicted confusion. He joined others in a petition to the mayor on March 18 suggesting "the entire street should be given the name of West Broadway for its entire length." The City agreed and in 1897 the building got a new address, 457-461 West Broadway. At the turn of the century Oeslner shared the structure with A. Arnold & Co., makers and dealers in millinery trimmings. The firm's main account was its associated company, Arnold, Constable & Co. department store. Also in the building was Schaefer Bros., dealers in "ornamental glass," including mirrors and glass panes for train cars; and the American Toy and Novelty Works, makers of tin toys. In 1901, before strict child labor laws, both Schaefer Bros. and American Toy and Novelty Works employed children under 16 years of age. They worked 59 hours a week in the Schaefer factory, and 60 a week in the toy shop. That year 21-year old John Wagner worked for Rudolph Oeslner as a driver. On Saturday night, July 14 his heavy brewery wagon was fully loaded with kegs of beer as he headed to a saloon far uptown. He was driving his team across the streetcar tracks on Third Avenue at 122nd Street when an approaching car sped toward him, clanging its bell, with no apparent attempt to slow down. The New York Times reported that the streetcar was "crowded to the limit of its capacity" and "Wagner started to pull his horses from the track and the front part of the wagon was clear of it when the car struck the rear at full speed." It was a tremendous impact. "The crash was heard for blocks around, and brought hundreds running to the scene, many thinking that there had been an explosion." When the collision occurred, the beer kegs were sent flying into the cars and injuring passengers. "Keg rolled through the open windows among the terrified passengers in the transverse seats, the rear end of the truck was demolished, and the car bounded from the track and swung at right angles to the rails, bringing up with another slam against the elevated railroad pillars." The newspaper noted that because the windows were open in the summer heat, more injuries by flying glass were averted. Four people were injured seriously enough to be hospitalized, including Wagner who had severe head cuts and a dislocated shoulder. One woman, 24-year old Carrie Walker, was the wife of the conductor. She was hit with a flying keg and removed unconscious. In fact, it appears that Wagner was lucky. The Times reported "At midnight, the brewery wagon, with both rear wheels gone and the whole back part shattered, still lay on its side on the pavement at the side of the street." In the summer of 1902 troubles formed within the management of the American Toy and Novelty Company. Its president, Julius Chein had fully owned the company before accepting David Heyman in as a partner and incorporating as American Toy and Novelty. Now it appeared he wanted it back. On August 8 he filed suit, claiming that Heyman had never supplied the $4,000 investment originally agreed upon and requested authority to dispose of the property of the corporation. Chein was successful and reorganized the company as J. Chein & Co. The firm would continue to manufactured tin toys here until 1907 when it moved its manufacturing to a new factory in New Jersey in 1907. By then the West Broadway building had a hodge-podge of tenants. Schaefer Bros. and Rudolph Oelsner were still here; sharing the address with disparate firms like John Reichenbacher, "cabinet work;" Wolf & Newman, "hat trimmings;" and the Manhattan Plating Works which did "gold plating, etc." Rudolph Oelsner was riding high at the time. He owned an 800-acred summer estate near Roselyn, Long Island named Awixaway. Like all moneyed businessmen, he filled his homes with antiques and artwork. When Silo's Fifth Avenue Art Galleries held a week-long estate auction in May 1913, he was there, paying the equivalent of $4,000 today for Rinaldi's Good Day, Signorita. But the end of the line for his business was on the near horizon. The ratification of the 18th Amendment, prohibiting the sale of alcohol, would bring an end to his empire. The Depression years saw a new type of business in the building. In the 1930s manufacturers King Lamps, Inc. and Broadway Lamp & Novelty were here. The industrial personality of the West Broadway block saw tremendous change in the last quarter of the century. As the Soho art district expanded into the neighborhood, Jordan Volpe Galleries took space here in 1977. The highly popular and successful gallery would remain for several years, not only exhibiting modern paintings and artwork, but in at least one instance, vintage furniture. On August 5, 1979 Rita Reif of The New York Times reported on a planned exhibition here of writing desks, including two examples by famed designer Gustav Stickley. By then The Ballroom had opened. The restaurant doubled as a cabaret and offered live shows like By Strouse in March 1978. Described by The Times as a "lively, fast-paced melange of songs, it was put together by composer Charles Strouse and highlighted songs he had composed for Broadway hits like Annie, Bye Bye Birdie, Applause, and Golden Boy. In 1980 Soho Wines & Spirits opened in the building and, like the Martin Lawrence Galleries which debuted around 1984, are still here more than three decades later. The 1990s saw new tenants like Razor Gallery and Yoshi boutique (opened in 1992). Yoshi was described in Suzy Gershman's 2008 Born to Shop New York as "a tiny store packed to the gill with frills that you'll want to touch and try on and own." After more than 125 years, John H. Whitenach's brick factory building is little changed from the time when horse-drawn drays loaded beer kegs on the street and teenagers labored inside at hot and noisy machines. His handsome design proved that no matter how utilitarian its purpose, a building need not be unattractive.